← Aquaponics, the future of gardening? In these last few months I’ve seen numerous images of dolphins, pelicans and turtles floating in the deadly and unfortunately coveted oil that is now spilled all over the Gulf of Mexico. But despite the media “bombarding” I still didn’t quite have a complete picture on what went wrong. The BP Gulf spill is the “worst environmental disaster in U.S. history” and no one still knows the extent of this catastrophe or how many generations will witness its devastating consequences. Let’s start by looking back a year before the explosion happened. On April of 2009 the U.S. 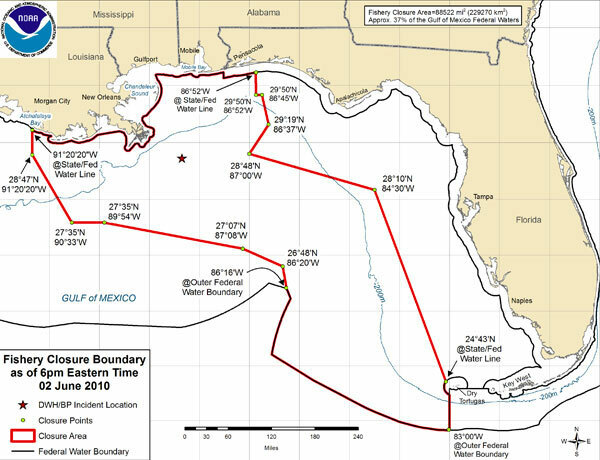 Mineral Management Service (MMS), the federal agency that regulates offshore drilling, gave BP a “categorical exclusion” from requirements to prepare a detailed environmental impact report because they thought a spill to be highly “unlikely”. The MMS claimed that the likelihood of a spill was less than 1% and that if a spill were to happen it wouldn’t be significant or release much oil. 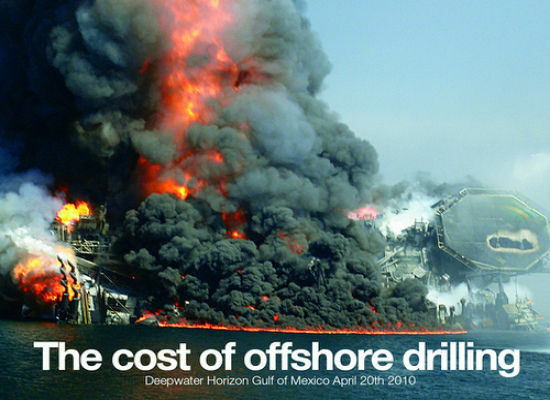 But on April 20th of 2010 BP’s Deepwater Horizon oil drilling platform exploded in the Gulf of Mexico, turning one of the world’ s most advanced drill rigs into a pile of twisted metal and putting the MMS and BP to shame. Initial reports estimated a flow of oil of 1000 barrels per day, a few days later it went up to 5000, and by the end of April it went up to 25,000 barrels per day. By the beginning of May the realization that this spill was the worst in U.S. history was undeniable, the final estimates went up to 100,000 barrels per day! Before the spill, BP had an environmental response plan which claimed that the company could recover 500,000 barrels per day using current technology, and therefore the worst case scenario spill would not pose any danger. In this report BP also claimed that a worst case scenario spill would not harm any of the fisheries or marine life of the Gulf of Mexico, including walruses, sea otters and sea lions. As you are probably thinking, there are no sea otters, sea lions or walruses in the Gulf. We later learned that BP copied and pasted word by word an old environmental response plan prepared for the arctic. They obviously did not take preventing an environmental disaster seriously and as a consequence they have endangered our finite and valuable resources with their carelessness and incompetence. So what did BP do in order to “try” to clean up their mess? Mainly two things: Burn the spilled oil and pour chemicals (dispersants) into the water. These two methods were used to cover their “backs” in the easiest and cheapest way without taking the long-term consequences into consideration. BP priorities are clear, economic profits before people or the environment. By burning tons of oil, not only did they release massive amounts of CO2 into the atmosphere, but also sulfur dioxide, carbon monoxide, nitrogen oxides, polycyclic aromatic hydrocarbons, and volatile organic compounds. 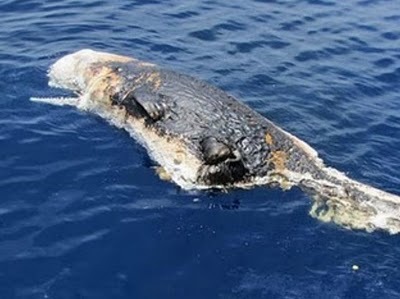 And they were not just burning oil, countless turtles and other marine animals like dolphins and whales were also burnt alive as shown in the picture below. According to the NY times, the dispersant used by BP (Corexit) was banned in the UK over a decade ago even though it’s EPA approved. Corexit was also used in the Exxon-Valdez spill and has been linked to human health problems including respiratory, nervous system, liver, kidney, blood disorders and reproductive problems. Dispersants like Corexit break up oil into droplets that linger longer in the water instead of collecting at the surface. 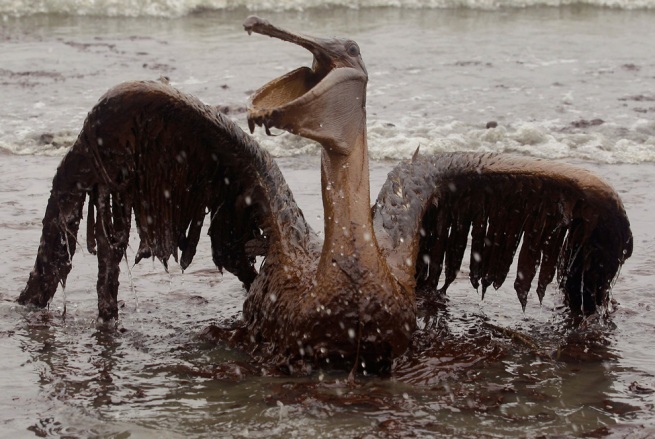 Their use in the Gulf spill has limited the instances (and images) of oil-covered seabirds, but has kept the effects of the spill mostly underwater. Dispersants have mostly moved the oil from the surface to the deep waters of the Gulf. 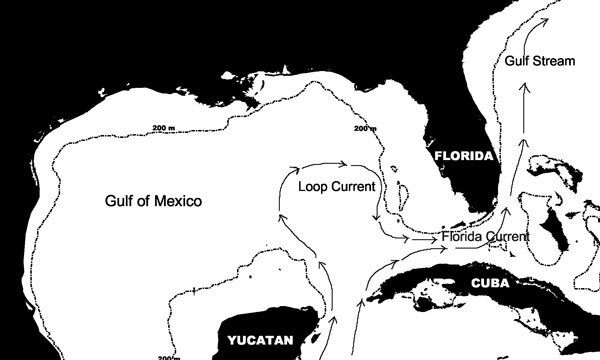 What is now feared is that these deep-sea pockets of oil are fastly approaching the gulf loop current which could spread the oil into the Atlantic Ocean. 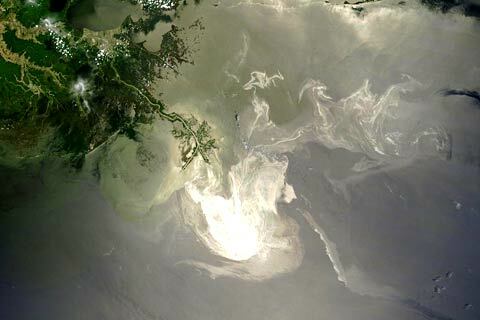 The most conservative figures estimate a total of 5 million barrels of oil spilled to the Gulf of Mexico. 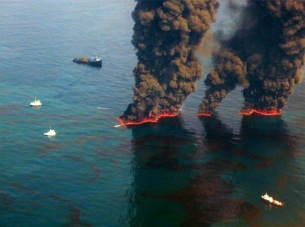 Scientists and government officials estimate that BP burned less than 1/4 of the spill, another quarter had dispersed into scattered molecules, 1/4 has dispersed into small droplets which are extremely toxic to animals, and the last quarter (five times the size of the Exxon-Valdez spill) remains as sheens on the water or tall balls in beaches. The long-term consequences of this tremendous disaster is still unknown. The oil spill’s impact on the environment and socio-economics of the region will continue for decades to come. In the first four weeks after the explosion that killed 11 workers and started the massive leak, wildlife officials say at least 500 birds, 250 turtles and 50 mammals, were found dead along the US Gulf coast. In the following months after the explosion, thousands of fishes, birds, mammals, amphibians and reptiles were killed by the oil, and their eggs and offspring poisoned. Most scientists agree that the damage to the Gulf wildlife will last for many generations due to the high toxicity of the area. Louisiana, the nearest state to the leaking well, around 42 miles offshore, has been the most impacted. The state’s governor stated in May that almost 200 of its 400-mile coast had been polluted at that time. The U.S. government has declared a “fishery disaster” in the seafood-producing states of Louisiana, Mississippi and Alabama due to the oil spill. 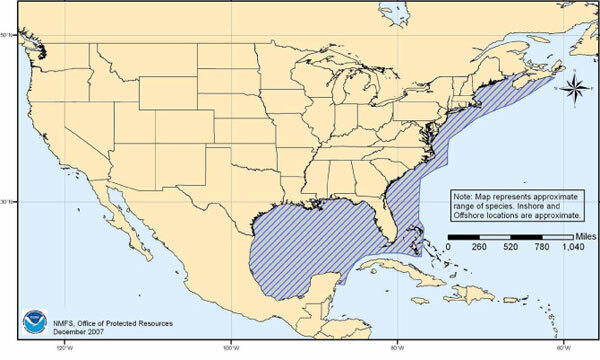 A quarter of US waters in the Gulf of Mexico are closed to fishing, hitting the livelihoods of shrimpers, oyster-catchers and charter boat operators. Marine biologists agree that “every fish and invertebrate contacting the oil is probably dying”. Most government officials said the impacts could take years to unfold. Scientists from the US Fish and Wildlife Service stated that “this is just a giant experiment going on and we’re trying to understand scientifically what this means”. 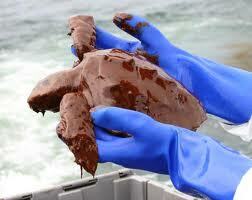 One of the marine species that has been mostly affected are sea turtles. Their range is shown in the map below. The Deepwater Horizon explosion is a direct consequence of our addiction to oil. The most important conclusion we should take from this disaster is the urgent need to shift towards clean renewable energies. The prize of oil becomes way too expensive if we take all its externalities into consideration. The clean up, environmental and health costs and impact on the local economy are all externalities that should be considered when paying for oil. In the long run green energy is not only cleaner and safer but also much cheaper! We only have a few more years of oil left before we exhaust the last reserves on earth, and we should be moving towards renewables at a much higher speed. President Obama just lifted the moratorium on deep water drilling, so unfortunately it looks like we will continue to drill until the last drop of oil, no matter how many more accidents, spills or deaths this may cause. Instead, we should be focusing in investing more into clean renewable energies, that is the only way to ensure an accident free and clean future for us and our kids. This entry was posted in Energy, Global Warming and tagged BP oil spill, Deepwater Horizon explosion, Gulf oil spill. Bookmark the permalink. These images are terrible, but the worse part is most of America has already forgotten about the spill and the damage that is still done to the environment.